Men, today is YOUR day on Buckhead Betty. 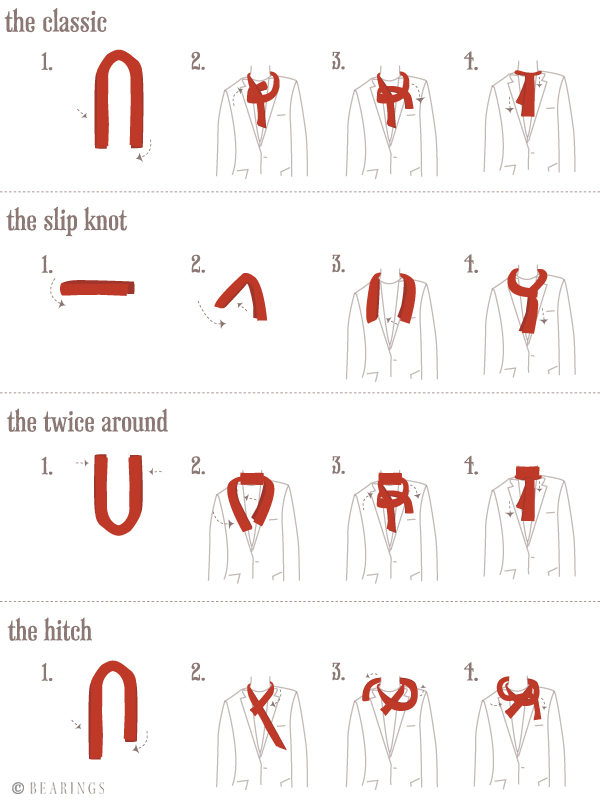 Because what arrived in my mailbox this morning but a helpful little tutorial on how men can tie your winter scarf! Note to the ladies: This guide is totally gender-neutral, so tie and hitch away! This lovely picture guide comes straight from Bearings, A Southern Lifestyle Guide for Men. Kudos to my friend Ben for the heads up on this goodie for my inbox! I subscribe to the website feed for Atlanta, but so far am really enjoying the bi-monthly newsletters, because they always touch on things I have never heard of or places that are brand-new to the area. They are all about off the beaten path meets society life. In today's edition, for example, I learned about a new (to me, at least) BBQ joint on the Westside called Heirloom Market, a magazine dedicated to bourbon and a Southern musical duo called The Civil Wars that sounds akin to Nickel Creek. Earlier this month, I got the download on new-ish restaurant Local Three before devouring comprehensive lists on Southern ski slopes and moonshine distilleries, of all things. Love it! Went to Heirloom yesterday! I think the sides were amazing! I thought we were all under the impression that style #2 is a male no-no. No? No. Chelsea- I heard it was written up in the AJC but missed it, I bet it was yum! C - style #2 would be ok under a coat though, right? Or off to one side with a skinny scarf, perhaps? Just signed up for Bearings newsletter, thanks for the tip!